January 24-31, 2015. 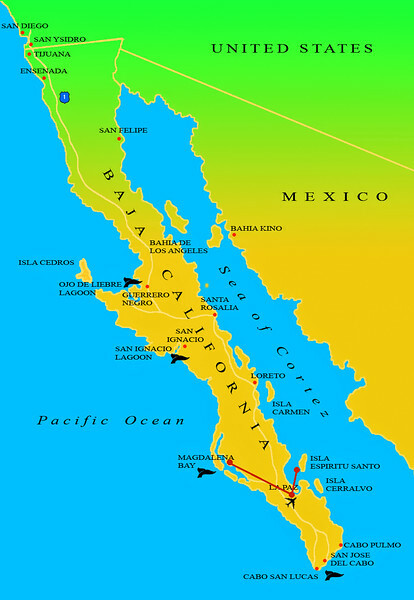 There are 3 grey whale breeding bays on the western side of the Baja Peninsula. Eleven of us, plus our guide and tour leader, were going to Magdalena Bay, the southernmost breeding site. We met in LaPaz for dinner on Day1 and then left the following morning for the 4-hour trip to our camp. The first 3.5 hours were spent in a van driving to the small fishing village of San Carlos; the last 30 minutes in a boat heading for camp. We would remain in camp for 4 nights, retrace our steps back to our hotel in La Paz, and then spend the last day in the Sea Of Cortez. Overall, it was a great experience, especially the people part. My fellow travelers were funny, patient, and just plain entertaining. However, it wasn't quite the wildlife experience I expected. My own fault for not doing any research on Magdalena Bay. Turns out, we were several weeks too early for the main whale action in southern Baja. Whereas whale birthing and serious courtship had already begun in the 2 northern breeding lagoons, the pregnant whales heading for Magdalena Bay were still enroute, as were most of the breeding males. We did have several "friendly" close encounters with curious breeding pods of 3 to 5 whales and we witnessed one full breach, but we were simply too early for the rest.